Not all gem stones are minerals. Though inorganic compounds make up the majority of the gem stone list, many of the most alluring and sought after members of the gem world are actually organic gem stones. First of all, organic gem stone must be considered a gem stone. Since this definition has evolved over time and is set by collectors and not gemologists, it can be arbitrary. Some stones that are commonly used in jewelry are not onsidered gems. Second, organic gem stones must consist of compounds that were originally living tissue. Organic compounds are among the most complex in nature. Many students in the sciences consider organic chemistry a bigger stumbling block than physics or calculus. The organic gem stone can be classified in two distinct groups; fossilized and contemporary. These are stones made of once living tissue that has been changed over time by natural forces into its current gem quality form. Amber is a stone formed from a tree sap fossilized over thousands or millions of years. Amber is usually clear with a yellowish color. This stone resembles and is named after ambergris, a sweet smelling secretion of the sperm whale once used in perfume making. Examples of amber containing perfectly preserved insects have been found and are considered very collectible. Fossilized organic gem stone – Jet. Jet is also called lignite, it is a type of coal. Like coal, it is formed from ancient deposits of decaying wood under extreme pressure. Jet formed in fresh water is called soft jet, while jet formed in salt water is called hard jet. Like its cousin coal, jet is a shiny black stone. The English phrase 'jet black' comes from this organic gem stone. Fossilized organic gem stone – Ammolite. Ammolite is the fossilized remains of ancient sea anemones. Ammolite is similar to the opal in appearance and often has a cracked or mottled surface. This cracking can give the stone the look of 'dragon scales' or a stained glass window. These are gems made from once living tissue taken from or left behind by creatures living in our time. Since they do not show the effect of eons of natural forces, some collectors do not consider these true gem stones. This, however, has a little effect on their popularity in jewelry. Pearl, resembling a small marble, is usually associated with the oyster, although it is found in other mollusks as well. At the center of each pearl is a small piece of sand or rock, which had found its way into the oyster's shell. The oyster attempts to soften the irritant by coating it in with calcium compound. 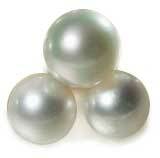 Over time, layer by layer, the pearl is formed.While usually white, pink, yellow and even black pearls can be found. A cultured pearl is produced when the irritant is inserted into the oyster which is living in specially created oyster beds. They are generally more uniform in appearance. Natural pearls are found in wild, untended oyster beds and are considered more valuable. This hard, usually white substance is the tusk or tooth of a living animal. The elephant, hippopotamus, the walrus and several species of whales were hunted for their ivory. In recent years, more and more people have begun to consider this a cruel way to get a gem stone and the sale of ivory pieces in many parts of the world has decreased. 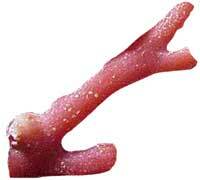 The stone known as coral is actually the skeletal remains of a filter feeding marine animal. Living in colonies, coral can form huge underwater structures, or reefs, stretching for miles. The great barrier reef in Australia is over 1,200 miles (or 2000 kilometers) long. Coral comes in too many shapes, colors and textures to describe here. In jewelry, whether polished or as found, is a frequent accent piece.